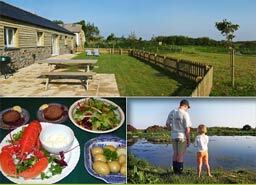 Here at Pollaughan Farm on the idyllic Roseland Peninsula you will find all you need for a perfect holiday. With superb sandy beaches very nearby and views to the sea children can feel free and adults can really wind down!! A private and tranquil farmstead set in 22 acres of meadows with donkeys, sheep, ducks, buzzards and abundant wildlife. 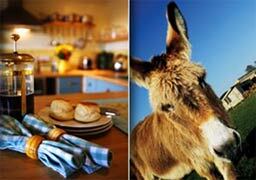 Spacious, beautifully presented, stylish cottages perfect for children of all ages. 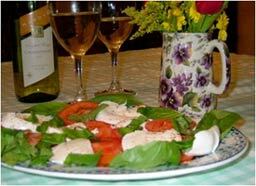 Home, Aga cooked meals service delivered to your cottage ready to serve! Giant trampoline and plenty for children to do. Sailing, windsurfing, tuition and hire nearby. 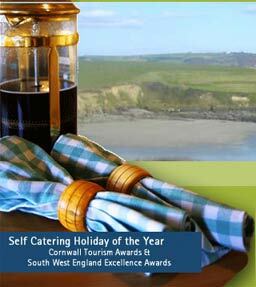 We have many awards for our holidays, green tourism and accessibility here. Many of our visitors are now regularly returning here to soak up the truly peaceful and charming atmosphere and recommending us to their friends. Our cottages are a real home from home and make for a perfect holiday all year round beautifully presented and comprehensively equipped. Relaxing neutral colours give a real sense of peace while stylish and creative furnishings give a really homely feel. They all have full oil fired central heating, the barns are double-glazed and the house has an open fire and also a piano! Comfort is key here with 6 ft beds, made up with cotton bed linen, thick towels and plenty of them, comfy sofas, spacious interiors and really powerful showers! The kitchens are comprehensively equipped with all you need to prepare everything from a gourmet meal to the children’s tea. In the gardens you will find furniture and a barbeque. We are inspected by English Tourism Council Accessibility Scheme to M2 level, suitable for wheelchair users with an able bodied carer. Willow Barn and Meadows each sleeping 6 in 3 bedrooms are beautifully furnished and very relaxing 5 star barns and are very appealing to everyone - level access, wider than normal doors, open plan layouts with wooden floors and colourful, very spacious wet floor showers with adequate support rails mean they can be used easily by those needing extra space and support. Freestanding shower chairs are available if required.